Tens of thousands of acres in Stephens and Palo Pinto counties have burned as two wildfires joined together to form what the state officials called a long, large fire. 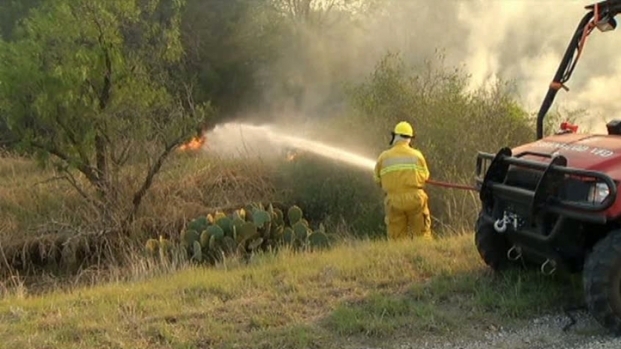 The Texas Forest Service said the Possum Kingdom fire joined with another fire in Palo Pinto County overnight Friday. The agency said midday Sunday that the wildfires have burned a combined 49,700 acres and were not contained. 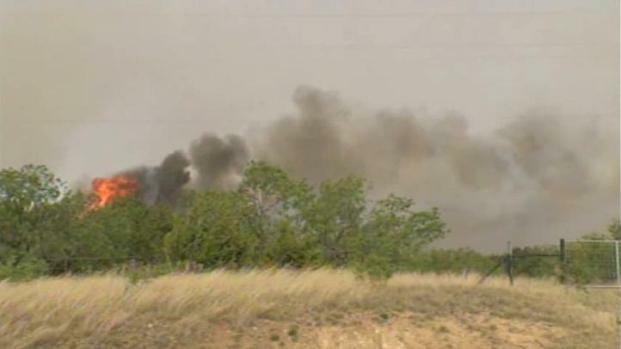 Another fire is also burning in the Possum Kingdom Lake area, the forest service said Sunday. 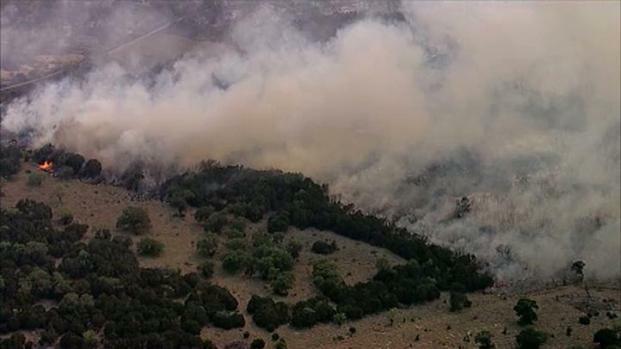 The 1,000-acre fire could have been sparked by the original Possum Kingdom Lake fire. The town of Strawn was evacuated Sunday afternoon. Anyone west of Highway 16 and south of Possum Kingdom Lake is being evacuated. Webb said the situation is expected to get worse throughout the week, up until and including Friday. "These are conditions we've never seen in Texas," he said. "This is a historical period. It is imperative that we urge Texans to be careful with the use of fire, and no outdoor burning whatsoever." The forest service said Saturday night that the fire had destroyed 31 homes and one church. Webb did not know Sunday morning if other structures were damaged overnight. Tens of thousands of acres in Stephens and Palo Pinto counties near Possum Kingdom Lake have burned. Strong winds and drought-stricken grasses and shrubs have fueled fires across the state. Crews hoped to gain ground on the North Texas fires Saturday, but the wind was pretty stiff and coming from a different direction. Because of that, the fire jumped lines that had already been dug. Hundreds of homes in the gated communities of Sportsman World, Gains Bend and the Cliffs were evacuated. According to the forest service, more than 300 homes on FM 2353 between Park Road 36 and State Highway 16 were evacuated Saturday. A reported 300-plus homes were threatened. "You don't ever want to see this," said Donna Hinkson, a Palo Pinto County business owner. "This is like a once-in-every-50-years-type thing, and you hope it never happens again." Brandi Larson, a Palo Pinto County resident, said the situation was "very scary." She said she hopes God protects their homes. A volunteer fireman died fighting a rural fire in southern Eastland County. "If not, we got the most important things out, which is our family and our animals," she said. Roads reopened Saturday around Possum Kingdom Lake, allowing residents to assess damage. Gary Glasscock, who owns a 300-acre ranch near Possum Kingdom Lake, drove Saturday from his home in Midland to find his ranch house and most trees destroyed. Glasscock said he could see treetops on fire in the distance through the smoke-filled air. "It looks like napalm bomb went off over here," he said, adding that some roads were closed in the area mid-day Saturday after state troopers initially allowed residents in the area. Officials closed Possum Kingdom State Park on Friday and cleared out its campsites. "This being a weekend, it would probably be pretty full," McCorkle said. "They wanted to get everybody out." The town of Gordon in southern Palo Pinto County was evacuated Friday, but the Eastland city manager said that the evacuation order was lifted later that night. The forest service said Sunday that more than 1 million acres of uncontrolled fires are burning across the state. "The fire, it's a bad one," Texas Parks and Wildlife Department spokesman Rob McCorkle said Friday. "This is pretty unusual to have this many fires going across the state at the time." In the North Texas region, fires are burning as far north as Wichita County and as far south as Stephens and Eastland counties. The community of Caddo was evacuated Sunday afternoon because of an estimated 2,200-acre fire in Stephens County. Burn bans remain in effect across most of the state. In the Metroplex, western counties such as Denton, Tarrant and Johnson counties are under burn bans, but eastern counties such as Collin, Dallas and Ellis, are not. In West Texas, some wildfires have been burning for days, including massive fires in Stonewall, King and Knox counties; Kent Stonewall and Fisher counties; and Jeff Davis County. But Texas could be fighting fires for as long as two months because of drought conditions around the state, said Steve Deffibaugh, another Texas Forest Service spokesman. A sense of urgency will remain "until we get a significant amount of rain," he added. NBC DFW's Scott Gordon and Julie Tam and The Associated Press' Angela K. Brown contributed to this report.